Lynne Edwards paints watercolor batiks, using her own wildlife photography for reference. Lynne's paintings, "Relaxing Before Fishing" and "Bear Cub," are based on two of my own photographs from Lake Clark National Park in Alaska. Lynne's website is rich with photography and paintings from her journeys around the world. 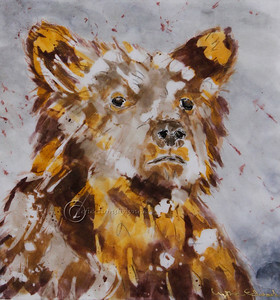 Visit http://www.reflectionsbylynne.com to see snow monkeys, leopards, polar bears, and more! 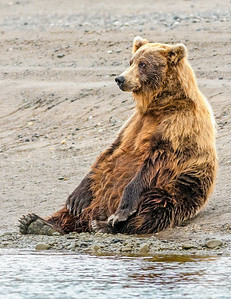 A coastal brown bear hanging out by Silver Salmon Creek in Lake Clark National Park, Alaska. By Lisa Aikenhead Photography. A watercolor batik painted by Lynne Edwards, based on my photograph "Sittin' by the Riverbank." 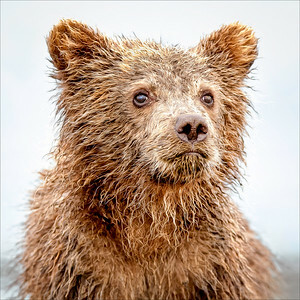 A coastal brown bear cub, only two to three months old, is wet and bedraggled after wrestling with its two siblings in the tidal flats of the Cook Inlet, Lake Clark National Park, Alaska. By Lisa Aikenhead Photography. 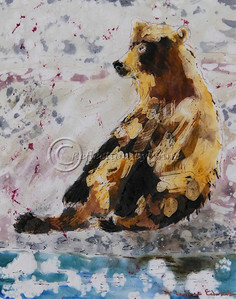 A watercolor batik painted by Lynne Edwards, based on my photograph "Bear Cub #2."